Squam is held twice a year at the Rockywold-Deephaven Camp in New Hampshire. The camp location is delightful, situated on Lake Squam with charming cabins scattered along the lake and tall trees everywhere. At times, I even wondered if The Parent Trap remake was filmed there. Spoiler alert: it wasn’t. I shared the Sunny Ridge cabin with a mother and daughter pair. Our cabin had a nice screened in sitting porch overlooking the lake, its own dock, and a nice fireplace in the common room. 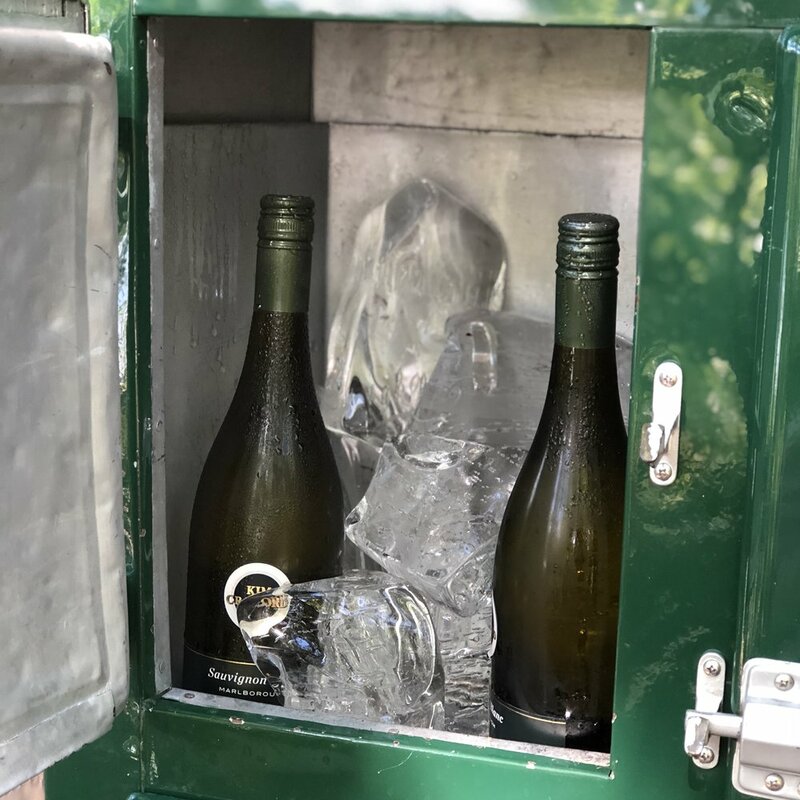 My favorite feature was the outdoor icebox. The ice blocks are “harvested” from the lake itself. Our private dock…and I discovered Barq’s blue label bottles at the country store. The two workshops I attended were Sweet Talisman with jeweler Page Sargisson and Stitch a New Story with Karen Stevens. I enjoyed both classes and loved that I left with (mostly) finished projects rather than adding to my long list of WIPs. I say mostly finished because Page took our wax molds back to her studio to cast into silver. I am excited to see the finished piece! I created a heart shape…no surprise there! In Karen’s class I worked on a favorite pair of jeans whose knee hole had expanded beyond fashion (and comfort) norms. Karen taught us over patching and under patching, as well as the best times to use each technique. Of course, I could not stop with that one hole in the knee. That is the dilemma….when do you know enough is enough? Karen’s jeans were mended and re-mended so many times that they did not look mended at all. They had been transformed into something else entirely. 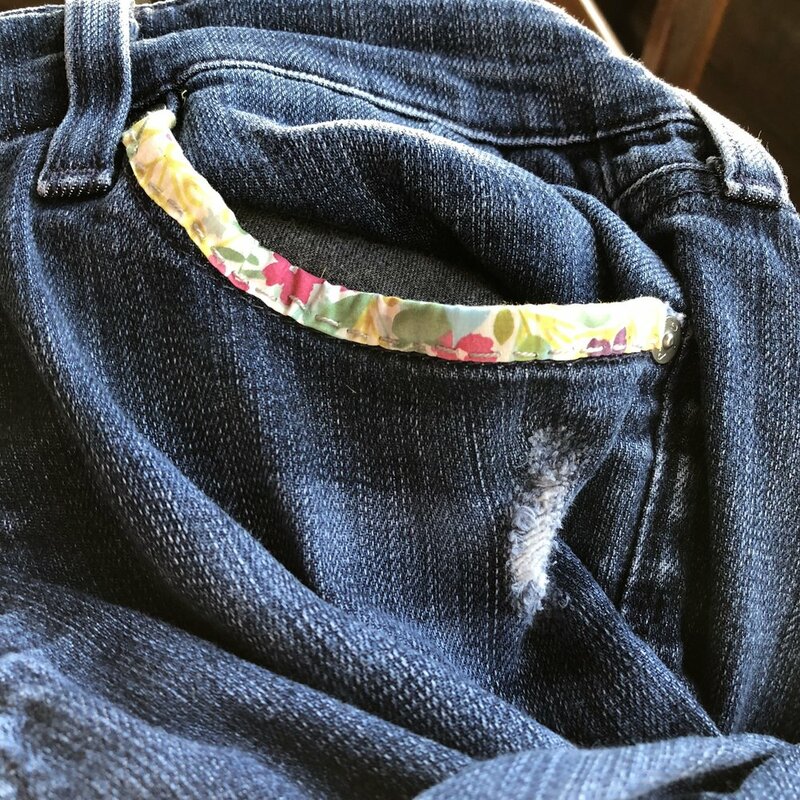 When I became discouraged that my jeans did not look as good as Karen’s, I reminded myself that some of her jeans were a twelve year progression of accumulated stitches and mending. So even though I went home able to wear my jeans again, I wouldn’t say they are “finished”. The after. That lovely glimpse of fabric is from my Japanese friend Yumi. So happy it now brightens my jeans. More visible mending with a scrap of Karen’s natural dyed fabric. Stitched in the creative studio space sponsored by Gather Here, while listening to Grace’s Simon & Garfunkel playlist. A lovely way to spend a free afternoon. A pretty strip of Liberty protecting my pocket. Crocheted circles and squares marked our route to the dining hall. More photos and information can be found by searching #squamlove or #squamartworkshops on Instagram.